When first announced, this set was received with great excitement by the fans community, because of the included pneumatic elements not seen for awhile. So today it is time for a well deserved review, here at TBs . 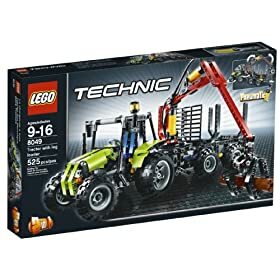 The 8049 (Tractor with Log Loader) is one of the latest LEGO Technic sets and the largest Technic set for the 1H2010, which should hit the stores very soon. The largest in 2010 for the moment, till we get to know something about the new sets for the 2nd half. After TLG to have revised their strategy regarding boxes size, due to environmental and transport economy/efficiency reasons, this one comes into a reasonable box size for the parts included. The box type used is one of those where you need to punch out at one of the edges, to get it open. Collectors... take care if won't want it damaged! Inside you will find three numbered bags with parts, which include some other bags inside for the smaller parts, one additional bag for the pneumatic parts and eight loose tires for the tractor and trailer. The instructions are presented in two square booklets, respectively with 76 and 64 pages, and fortunately this time, I got these in perfect condition from the box interior. As usually for the time being, the number of steps used in the instructions seems to me, a bit exagerated. Hope it is really helpful for the youngsters, otherwise it is just a waste of time and resources. Fortunately it doesn't get into boring levels, because the model is not that large and the construction itself is also not repetitive. Detailed steps are however welcome in what concerns the routing of pneumatic hoses, which are introduced one by one and my turn a bit complicated to follow for the average builders, when several are introduced simultaneously. At the end of the second booklet you will find the inventory of parts included with this set (spares not accounted), which could be of convenient use. Don't know whether there were some intentional actions taken by the building instructions team, regarding the Pantones used or the printing quality, to improve readability and ease the distinction of Black a Dark Bluish Gray colors (a common and well know issue). However I didn't have any difficulty to distinguish them, while building this set. One thing that might have helped too, was a good mix in the usage of both color parts across the model, which made them to appear almost always together in the several instructions steps. In terms of new parts there aren't much of them included with this set, however still a few which are always welcome. We get one 7L Gear Rack, from the same new design type of those 13L with axle and pin holes, as used in the 8258 (Crane Truck). Most likely this is the same part used for the steering in the new buggy (8048) and thus presumably included with that set too. There are also three of a new pin type (Pin Long with Center Pin Hole), which may turn into a very useful part. Myself have many times wished something to attach in the middle of a 3L long pin, whenever wanted to connect beams but at the same time keep them separated by 1L, and there was no space available for the double version. Hence I will call it the spacing pin. This design has also the advantages of allowing a cross axle, or the connection to a beam going in the perpendicular. As you can see from the photo, the end pins used in this new part are from that type with friction. And finally nine Axle 4 with Stop (87083), used as axels to hold the wheels on the tractor (4), on the trailer (4) and one used like a winch to attach the trailer to the tractor. Quite handy for fixing wheels in free rotating axles, at small/medium scale vehicles, like this. This is a set which I'd say to have a very good balance of parts in what regards the usage of colors. While not making extensive used of some most used colors, it takes a very good color mixture and and nice looking balance. I'm naturally referring to usage of the Lime and Red colors. It made me even to get a better impression of the Lime color. For a Technic set, it also includes some unusual SYSTEM parts, like: a 9 x 13 grill, curved slopes, clips and even some 2x2 round bricks in Reddish Brown for the log. Definitely all the furor being caused by this set, goes for the included pneumatic parts which were here reintroduced into a pure Technic set, for the first time since 2006. Not that it was a very large hiatus in the usage of these parts, but more for the fear felt in the community of them being replaced by the newer Linear Actuator parts. This is a very good opportunity to get a good assortment of these pneumatic parts (pump, large cylinders, valves, 'T's and pneumatic hoses) probably through the acquisition of multiple boxes. Specially for those recent fans who have been wanting to introduced themselves in the pneumatics constructions, but can't afford to get the parts at BrickLink due to the exaggerated prices being practiced. Hopefully BrickLink prices will also drop considerably, due to the supply reestablishment as as the demand goes down. For those used to complain about TLG frequently repeating the same type of machines and vehicles in the Technic theme, this is probably a very good example of something where nothing similar was released for more than a decade. It was back in 1996 the last time a log handling machine (also with pneumatics) was done as an official Technic set. It was the 8443 (Pneumatic Log Loader) - Also a very good set for the time and the parts then available. I'd say the scale, type of machine and functions, make it a natural choice for the usage of pneumatics and even more to justify their reintroduction. It took me a bit more than two hours to build this set, while taking the photos and some notes for this review. The first booklet starts with the construction of the tractor, that uses just parts from bag with number 1, plus the respective tires. Naturally it starts with the chassis, which uses most of the new parts included into this set, as you can see from the photo below. The new pins are are the sides of the chassis and there is a third one in the central part from the backside. Weren't it possible to use 12t double bevel gears in place of those two yellow knob wheels, that transmit movement from the HOG on the top, to the steering axle? Does it violates any forbidden design rule? Wonder why it is used a pair of half bushes in each front wheel axles, instead of one standard bush, which are also used in this set anyway. Unless they are used at larger quantities in the B-model, which I doubt to be the case. After almost 40 major steps, here we get the tractor complete. It looks quite nice with its vivid colors. I just wonder if it was too much complicated to make something extra, to fit under the tractor hood!? However we all understand that for a set targeting this size, every part counts and tis was not exactly the main purpose aimed with this set. Personally I've also enjoyed the way the tractor cabin was built and its final look, making used of non-straight and less conventional angles between parts. The construction proceeds to the trailer, whose main interest is obviously the pneumatic functions. There were used the bags numbered 2 and 3, as well as the one with the pneumatic parts and the remaining tires. The assembly starts with the chassis and the first pneumatic elements, to easily get into the crane arm as seen from the images below. As mentioned before the instructions steps for installing the pneumatic hoses are well detailed and make it a lot easier when compared to the way it was done for some older sets, or at least less error prone. The pneumatic hoses are also supplied precut to the correct lengths and colors. This removes a little bit of the building experience, but on the other hand it also avoids eventual errors for the less experienced, which are very likely to happen to some, with all the associated frustration. The pneumatic hosing used in this set also seems to be more from a vinyl type, than the silicone used in some older sets. This has the big advantage of avoiding the dust to easily fix on the hoses, hence improving the handling experience and model shinning look. Despite nothing innovative, the house routing through the usage of a perpendicular double split connector is also a very nice detail, to avoid getting loose tubes around the crane arm. In the end we just need to attach the trailer to the tractor, where the trailer fits through an axle with stop in the hole from the spacing pin, at the tractor's back. And here it is a photo from the whole set together. The set comes with with a log made of brown round bricks, but I'm sure you will find a lot more, to add into your play area. Probably even some real small wooden logs cut from tree branches, taken from your backyard. A cute set I would say. And long live to the LEGO pneumatics! 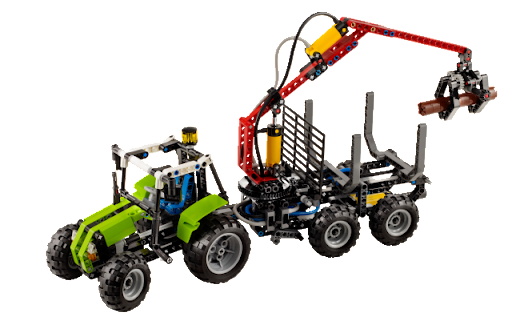 In terms of playability the 8049 main model is a three-in one, whereas boys can play with the tractor alone, the trailer and its pneumatic functions or the whole set together. It doesn't have a lot of functions, but those it has are of great playability. Pneumatic Technic sets, are among my favorites exactly because of their extended playability. Pneumatics are ideal to get parts moving fast, in models where positional precision is not a requirement. Easily you can achieve simultaneous movements, by actuating the air pump with one hand, and operating more than one pneumatic valve levers with the other hand. Depending on the models, many times with small skilled finger shifts, it is even possible to control multiple valves quasi-simultaneously, achieving gracious movements and a great joy. Some have also mentioned their concern about the convenience to manually actuate the pneumatic pump in this set, because of the way it is positioned under the trailer chassis. Its positioning along a longitudinal axis may turn difficult to keep the model steady, while pumping air into the cylinders, thus making it move forward. This is that kind of things we can only be sure about, when testing the real thing. So I did! The conclusion is that this was effectively taken into consideration during the design process. As you can see from the photos below, there is an handy and strategically positioned vertical 5L beam, where you can hold your thumb while actuating the pump with the index and/or middle fingers. This way the trailer keeps steady in its place. Another frequent comment is about the option taken for the claw operation. Understandably some are questioning why using gears to open/close the claw, and not to have also included one small pneumatic cylinder to make it work like in the former 8443? Certainly it would have also required an extra valve, another 'T' and some more hosing, but definitely it would have been a better and more natural choice. Also a good opportunity to increase the assortment of pneumatic elements reintroduced, and not to speak about the benefit in terms of playability. At this point it is not difficult to imagine, what's gonna be the most common modification, that AFOLs will to do this set. Still within the forest machines theme, the 2nd model suggested by the TLG for this set is a Log Handler vehicle. This one, a much closer successor for the 8443 above mentioned, in terms of form and functions. As mentioned in the initial data at this review, the instructions to build the B-model are not included in the supplied building instructions, but available for download online. Despite still not having built this model, I already feel in-love with it! It looks great and could probably have been also a main model in itself. Most likely I'll make it a target for another TBs review, to come. So I'll leave the details for a next opportunity. The verdict ant some additional nuts, will come on the 2nd part. Fascinating! It looks like a really fun set. And those 7L gear racks are something to be excited about. How did you manage to get one of these already? Was it supplied by TLG for your review? The double bevel gears would have worked just as well as knob wheels for the steering. My guess it that either they wanted the knob wheels for the alternate models, or it was just a way to provide a more varied parts list for the model since it already has several double bevel gears. Usually the knob wheels are used for gear meshes which disengage like the steering on a truck with a tilting cab (i.e. 8273). I think they used half bushes for the steering because two of them are much tighter on the axle than a regular bush. This way the axle stays in place when you push on the wheel. Looking at the usage of the new pins with perpendicular holes, I can't see any reason these were needed instead of using regular long pins. Am I missing something? What about the new 4L axles? They are clearly the most important new part, and will quickly become one of the most commonly used axles in official sets, as here there are 9 all fitting perfectly into the model, whereas a 3L or 5.5L would fit pretty awkwardly. I think the reason for having two half bushes on the front axle is to prevent the 4L axle from being pushed further into the 'Steering Arm with Connectors', as when this happens it is quite fiddly to undo. I like this model and will probably buy it when it comes out, but there are very few gears included, which is mainly why I prefer linear actuators to pneumatics. I didn't see blakbird's comment before I posted mine (I said basically the same thing about the pair of half bushes on the front axle). this will probably be most used, as said in the review, in situations where there is two stud holes facing but there is an unfilled 1m gap between them. using the regular 3m peg would allow the sides to be 'pushed in' towards each other. The knob wheels are also used where torque is too high, in order to avoid gears teeth to slip, under stress. Usually for these cases, they are used in front of a motor. I also agree the knobs should have been used for diversity sake. The explanation for the half bushes usage, also makes sense to me. Thanks for explaining that! Also in the tractor there is one of these pins at the rear, that's were the trailer engages, by feeding one 4L axle with stop, into the pin central hole. you are absolutely right about the 4L axles with stop. Don't know, how could I have forgotten to include them in the photo. Must fix this soon. Ahh.. now that I've seen what this set really contains (review + B-model building instructions), I'm wanting this set more and more. How many axles 4 with stop does it contain in overall? I counted 7 but I might have missed some and there might be some unused that are used in the A-model. It includes 9. All used in the main model (4 in the tractor wheels + 5 in the trailer). I made a LDraw models of the new pin piece and axle 4 with stop - because I don't have the part and am only guessing (and also because I don't have assigned x-numbers or design IDs) I cannot submit this to the Parts Tracker. So I uploaded them into Brickshelf. Use at your own risk - if you use these you'll have to remember to update the models after the part gets to the PT since the filename will be changed and obviously no Moved-to files made. As for the 3L pin, there is nothing in the part, and BrickLink gave it its own ID for the moment. As far as I know, Philo had already designed the axle for PT as well as the other new parts. Most likely the axle is not there already, because he didn't knew the ID. Great review thank you! The Buggy actually has the same steering rack as the 8858 from 1994. Isn't the part ID quoted next to the part on the inventory page, or is that the wrong number 8^/. @Jernej I was wondering the same thing. Does the pin piece have friction BTW, or is it spinning freely? Like 'Axle 8 with Stop', 'Axle 5 with Stop' and 'Axle 3 with Stud', this one also spins freely into a Technic hole. D'oh! How come I can never see it from the text? :( Thanks! the new long pin with the Axle Hole in the middle could be great for heavy universal joints. A reason more to buy this model more than once.